Jetlagged but excited, I woke up on Monday, November 25th ready to start my first 24 hours in Paris. The darkness that lingered from the more northern latitudes was an indication of one difficulty I will have when rising in the morning. 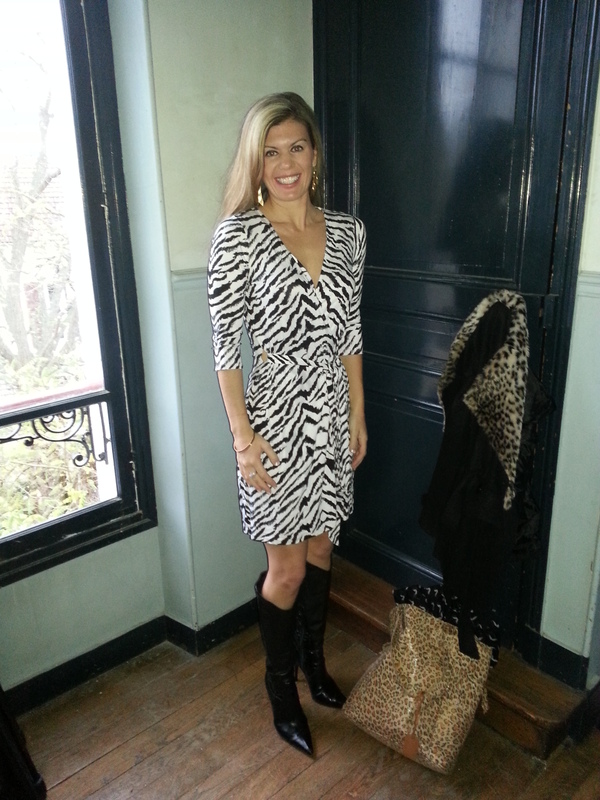 I was ready to take my first commuter train wearing my first day of school zebra patterned Express dress. Accented with high, five-inch heeled boots, I crossed my fingers the animal print highlighted in the 2013 Vogue Fall Fashion guide was accurate. Of course, this depiction of 18-year-old fashion models roaming around Paris during fashion week, wearing the funkiest clothing outside of Michaem Kors wardrobe; keeps to Paris’s reputation as one of the chic fashion capitols of the world. Yet, little to my knowledge, I will soon find out, real Parisian women are a bit more practical. I walked with my new roommate and tour guide, Maud to the regional station at Mantes la Jolie, a suburb outside of Paris. I met Maud, Ariane’s sister, seven years ago when I came on my first venture. Maud had welcomed me into her home as a jumpstart until I found my own place in Paris. Luckily, my class started at 11:00am, one hour later than it will for the rest of the week, so Maud could be my guide through the massive metro system. 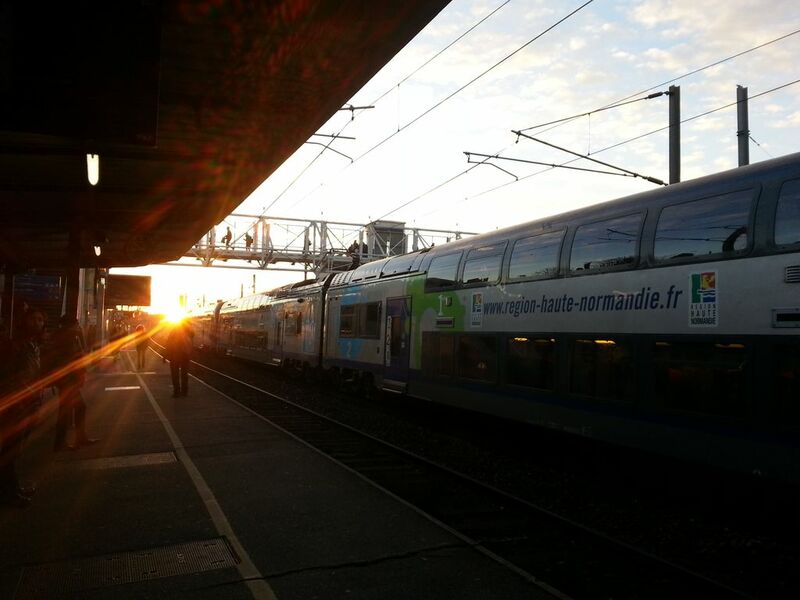 We hopped on the Sans Arret SNCF at 10:08am, the regional train system of the Paris suburbs, to Saint Lazare. When looking at the train schedule, I quickly to had to figure out which each description meant, stops or no stops. One thing I learned on my first day is, be careful as if you are leaving in the evening, the longer you wait the more gap between the trains. If you wait till after 9:20pm, the next direct is not until 10:20pm and every hour after that. 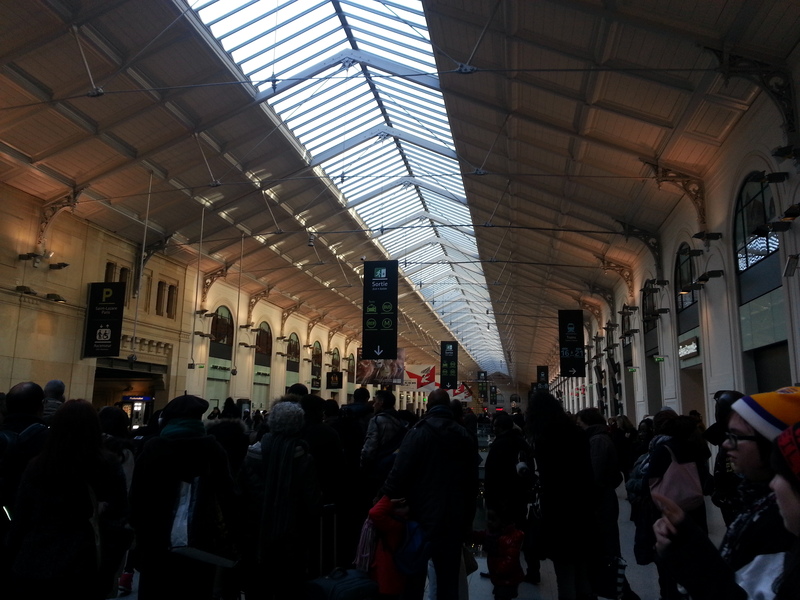 When arriving at Saint Lazare, we were pushed out the train join and follow the crowd of commuters. I quickly learned the etiquette as we entered the station, to stay on the right, as in any passing lane, if you don’t want to get run over. As you enter the station, it opens to a trendy triple story mall packed with the all familiar stores of Guess, Lacoste and a Starbucks. I was pretty turned off by this familiarity but as we walked towards the metro I was distracted by my first sight of the glistening pastries we began to pass. 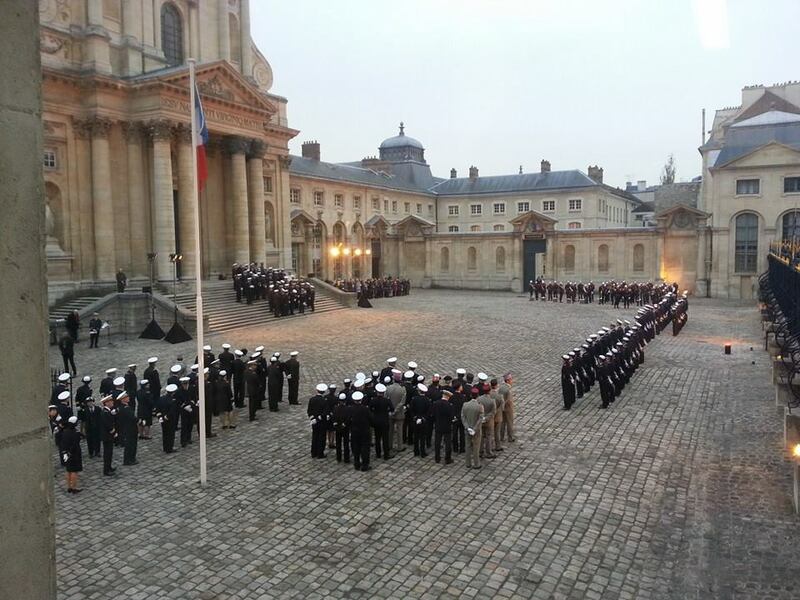 I noticed two main bulangeries, which seemed to have the look of a chain, La Crottasire and Paul. I found they were all over Paris, in the train stations and in the suburbs. As we continued to rush down the spirally maze with the stampede to the underbelly of Paris, Mud led me on two metros. The M14 to Chatlet, a major transfer station, then to the RER B. I paid close attention to the lines and path as I had to find my way back to meet her that evening at Saint Lazare. I noticed many travellers holding suitcases and saw this route went to Charles Dulle Gaulle airport. This was good to know when I would finally be able to travel. We finally arrived at my metro stop, Port Royal. Exiting the station on Port Royal Boulvard, I entered the outside to an overcast sky towering the beautiful 19th century limestone buildings. Looking around with pure gaze, like a child seeing Santa for the first time, I smiled in amazment, I had finally made it. 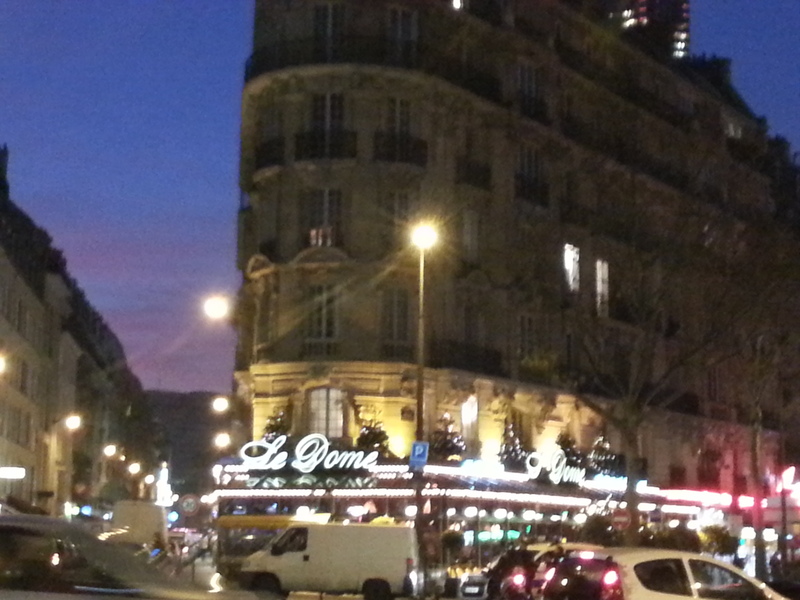 I was in the middle of Paris, as a not as a tourist but as a Parisian. Maud looked at her phone to see where on Port Royal Boulevard we should turn in order to head towards my school. 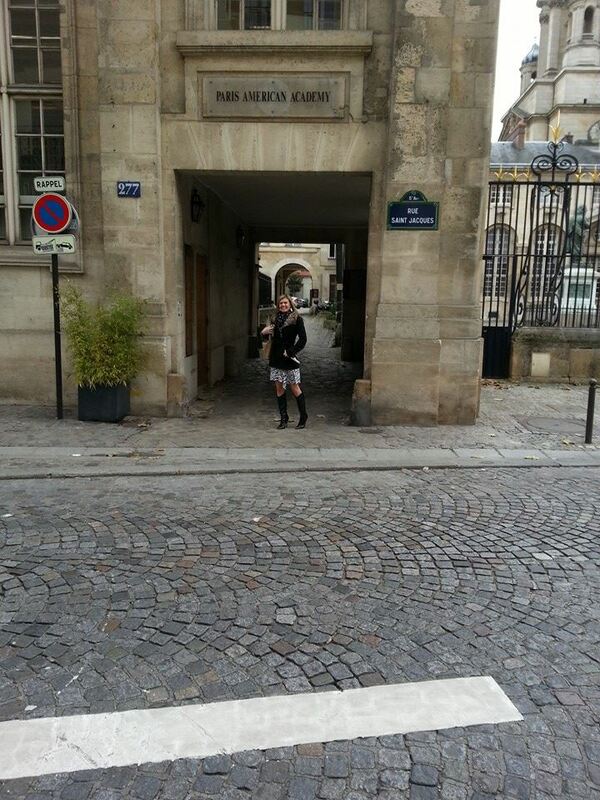 We walked down the street passing the simple pieces of furniture that made me love Paris. The woven patio chairs with scattered bistro tables outside the batesseires, perfect for an afternoon espresso, glass of wine and people watching. The true way Parisians enjoyed every minute of life. We turned at the corner of Rue Saint Jacques, a narrow street with uneven cobblestone sidewalks and gorgeous apartment buildings. An area that held the vision of what would one day be my apartment. A beautiful 18th century building lined with ironcast patios and shuttered covered windows, plus maybe a French husband included. 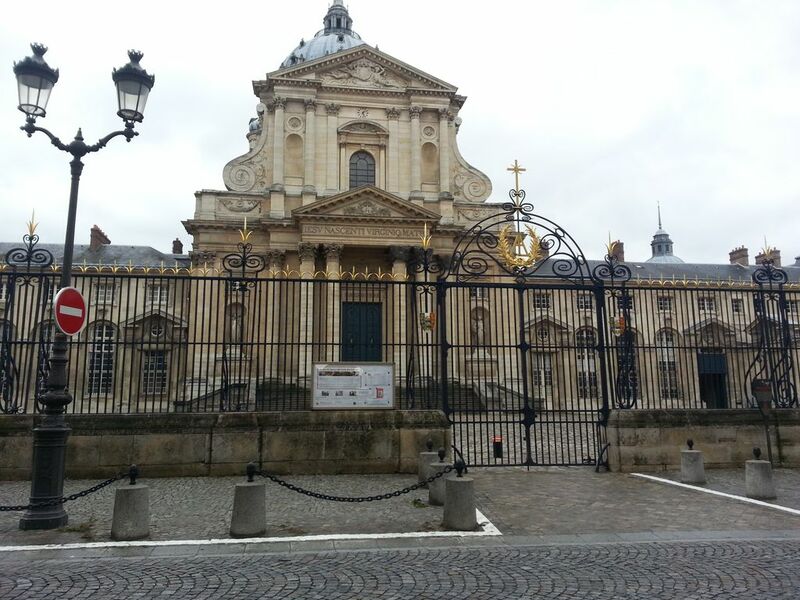 Up on the right a beautiful basilica like building with gold statutes stood guarded by a large iron gate. Maud read the sign and said, “It is a military musueam”. It would have been too good to be true that I would dare study in such an asylum but too perfect a dream would not live anything to the imagination. At the end of the gate was a driveway with a small overpass similar to that in New Orleans. We walked down the driveway to see a small glass door around the corner and some 1980’s patio chairs outside. “ This is your school” Maud said. Of course it is. A man with a thick Italian accent came running to the door to greet us. Like any kid being dropped of by their Mom on the first day of school, I gave Maud a big hug and kiss. She gave me a, “good luck” back and I got ready to meet my new classmates. My class was up a spiral staircase at the Paris American Academy which hosts design students. In the back, was a small room looking out at the military museum and my future apartment. 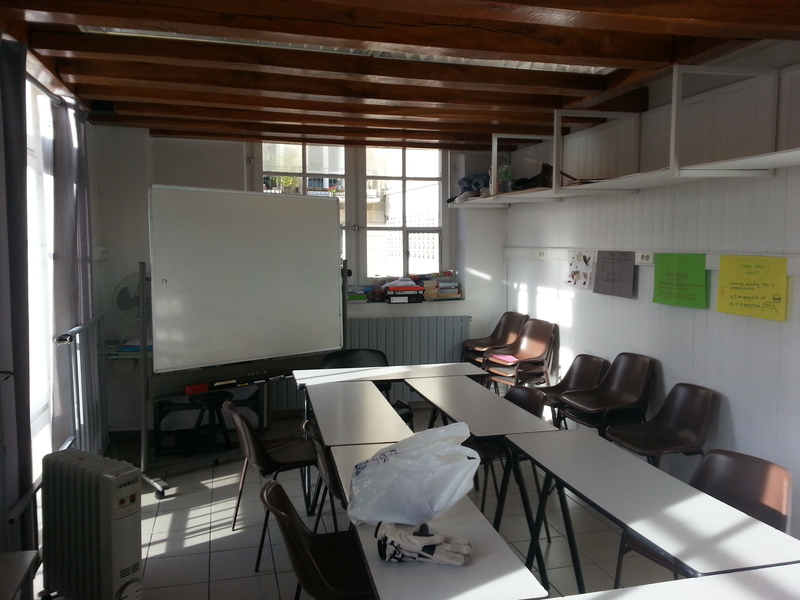 I was surprised the room was so small but it did not need to be any bigger because our class was not any bigger. There were only 5 students, 3 Americans, a woman from Iran and myself. The most shocking part was the ages of the students. Most TEFL certified teachers were recently graduated college students. In this case, I was the youngest by at least 10 years. Though it started to make sense as I found out more about the students. Just like myself, they wanted to make a career change and needed to find a new exciting way to do it.After making our initial introductions, we got straight to the lesson. We finished the day around 5pm and after speaking with two American students who had lived here for 10 years, I decided to walk around my new city of light. Night time had fallen quickly, right after 5pm and I was still enthralled by all the beautiful buildings and the plan fact of, “ I am here, I LIVE in Paris!” I passed artistic statues, rows of small restaurants, nail salons and pharmacies. I was curious where the Eiffel Tour was because even behind all the buildings, it was nowhere in sight. The good part about living here was, I had plenty of time to find it. I strolled down the street feeling the cool breeze against my face and my teeth from smiling so intensely. The feeling of satisfaction I was absorbing was one I had never felt before. I truly felt it could have all ended today and it would not matter. I came, I saw and I conquered. This was the feeling that I been longing to achieve, to know what my dream of living in Paris looks like real life. I no longer have to say “what if” or “I regret”. It was the best emotion, feeling and tingle I had ever felt, I hope it never ends. After my first Paris stroll I gave myself time for mishaps on the metro when going to meet Maud. I quickly found another Starbucks in order to use the wi-fi to message her I was on my way. I found the route back to the Port Royal station and rushed through the stampedes with ease. I could not believe how easily I remembered my way back and headed to the Starbucks at Saint Lazare to meet her. It was already a total nightmare trying to get wi-fi that worked and would be accessible without having to sign away your first unborn child. A little nervous she would not find me, I was relieved as she arrived with all smiles to pick me up from my first day of school. 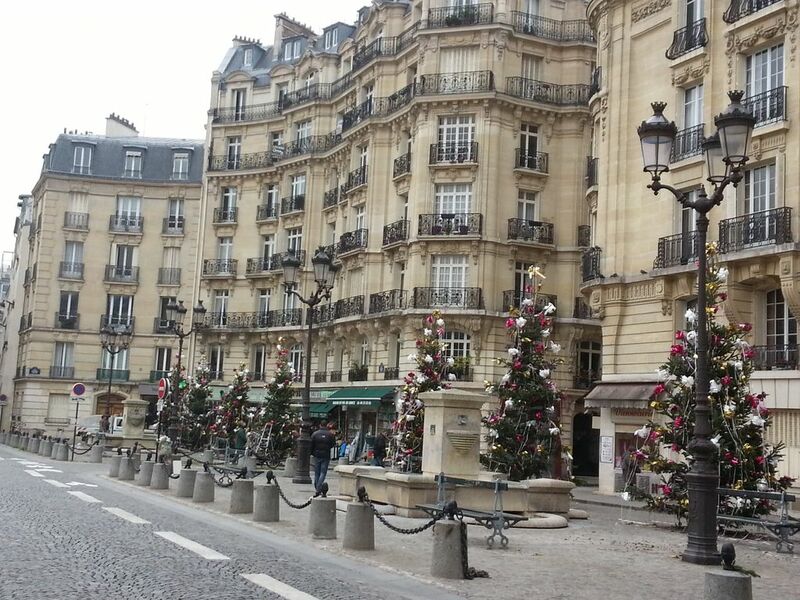 I was all chatters as we walked across from the station to the Saint Lazare shopping center. The cobblestone walkway was all light up with stores and christmas lights that made a beautiful grand entrance. It was 8pm so unfortunately, all the shops were closed. Maud made me well aware that if you want to buy anything, you better to do it early and forget Sunday. The consistent American accessibility I was used to was about to be long gone. We arrived at a small bistro called La Burlerie Caumartin. Greeted by a young man with glasses, who knew right away, I was an English speaking American. So, Maud did all the ordering but the server tried to speak what English he knew to make me feel comfortable. We started with a delicious glass of apple wine, not cider, in what I thought was the wine glass from my grandmothers small port collection. The glass was so petite that I was wondering if it was from a child’s play set. 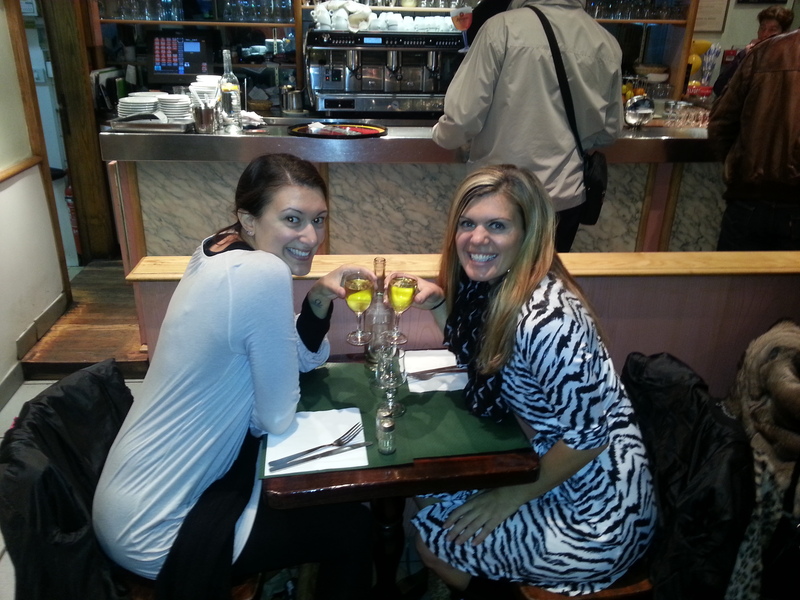 We ordered our main meal and I could not have asked for a better first French meal. 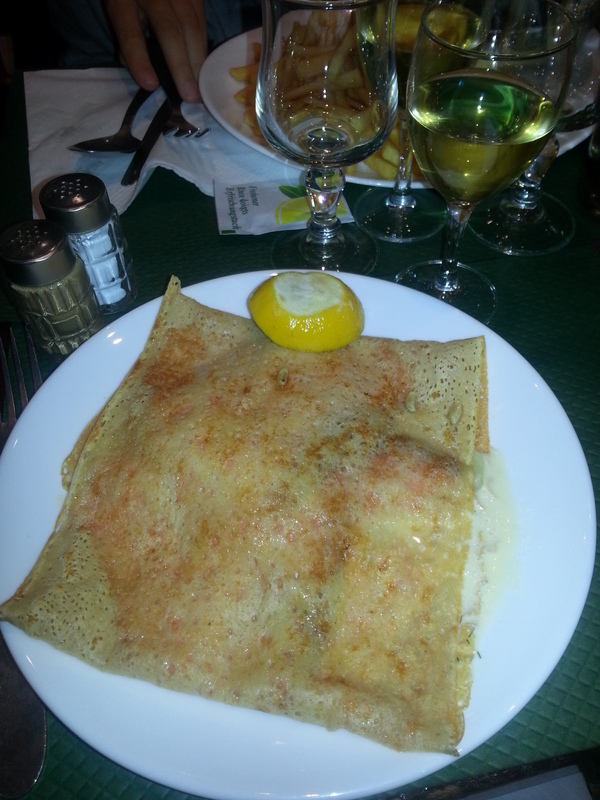 I ordered a savory salmon crepe as Maud got the ever so popular moules and frites (mussels and french fries). It was exactly how I remembered it tasting seven years ago. A perfectly, thin crepe filled with dill sauce and fresh salmon. I could just end there, so we finished with a nutella, banana crepe. The food was excellent and the entertainment better. As a finale to our delicious meal, magic tricks were delivered from the Maitre D at no extra charge. We got the double decker train at 9:20pm feeling full and satisfied. However, my luck seems to never be this good to be true and as the conductor came to collect our tickets, I noticed Maud arguing with him. I was trying to understand but apparently I had the wrong type of ticket and he was not letting it go. Maud tried to say I was an unaware tourist but as in any city, they love to charge their fines. A 45 euro fee for not having the correct regional ticket was an ironically good first lesson. It was a blow to the perfection of my first day but I guess I could say, got that out-of-the-way. Though upset about my expensive train ride, I quickly forgot it when I remember my first walk down Port Royal boulevard. The high I got knowing I had arrived was overwhelming. To think I get to go do that all over again and again. As I settled into my new bed I looked out the window at the beautiful French rooftop across the way, teary eyed. After all the pain I suffered, I had my reward. I had never felt so accomplished in my life, I made it, I made my dream come true.